There have been a series of banning in Nepal recently. It looks like, various government agencies are depressed by the failure to form a government two after the resignation of he current PM and are venting their dissatisfaction in the form of banning everything they don’t like personally. This time, a promo of an upcoming album of Komal Oli was banned from Nepal Television. Komal Oli once used to be the news anchor at the TV. The promo was being broadcasted in the television for a couple of weeks. It was suddenly halted on Sunday. In the controversial song, calls Lord Shiva a Badmas. According to Nagariknews, the NTV Chief, Prakashjung Karki told that Komal Oli doesn’t have the rights to name Lord Shiva a Badmas. He thought it is against Hindu sentiments. Is the Hindu religion getting intolerant to such a simple thing as name calling or are these so-called society leaders making unnecessary fuss? 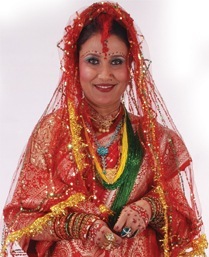 Unmarried singer Komal Oli is known to come out with controversial songs in the occasion of Teej every year. A song called “Poila Jana Paam… ” created similar controversy a few years back. The suggestive songs about her inability to find a suitable male to get married have been quite popular. All the videos are removed.